A legend reborn. Strong, muscular lines, impeccable manners, outstanding engineering, a tour de force. Thunderbird was voted 'Cruiser of the Year' by Cycle World magazine. 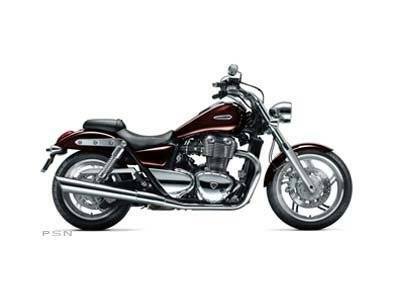 It rewrites the rules and brings Triumph's reputation for handling and engineering excellence to the cruiser market. Personalization? No problem, with great paint schemes and over 100 accessories, it's what cruiser riders have been waiting for. Liquid-cooled, DOHC, parallel twin, 270 degree firing interval 1,600 cc Triumph engine with unmistakable character, sound and pulling power. Delivers near endless torque at low revs with 85 bhp and 108 ft. lbs. at 2,750 rpm. Supple suspension for mile eating. A finely calibrated system which blends effortlessly to complement the bike's looks. Rear adjustable for preload, it's ready to go - one up or two. Dual front discs deliver smooth and progressive braking. ABS too. Class leading instruments, tank mounted. Large speedometer, tachometer, two trip meters and fuel gauge in a chromed nacelle with unique Thunderbird logo. Just 27.5 inches off the ground. Cruise alone or with a partner and still plant both feet on the ground. Well padded and comfortable with a range of seat accessories for even more comfort. Each gear change with the six-speed box feels precise, smooth and satisfying. The first belt driven Triumph since 1922, it grabs all that torque and plants it on the road. Low maintenance rear pulley is durable and clean running.